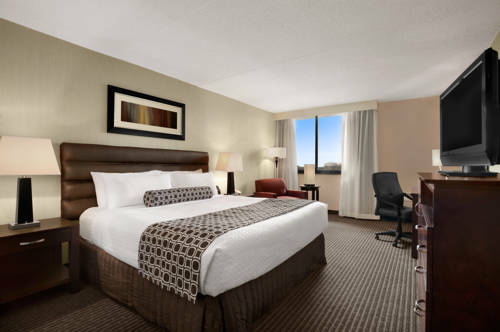 The Crowne Plaza Columbus North-Worthington offers 300 upscale sleeping rooms and is located off I-71 and I-270. Local businesses include: J.P. Morgan Chase, The National Board of Boiler and Pressure Vessel Inspectors, Vertiv, Ryder Systems, Siemens and Anheuser-Busch. Features that will make your stay comfortable include HDTVs, free Wi-Fi, refrigerators, room service, concierge lounge, 24 hour Fitness Center, Indoor and Outdoor Pools and 24 hour Business Center. Our banquet, meeting and event space totals 20,000 square feet of flexible space, including the elegant Grand Pavilion. The Crowne Plaza Columbus North-Worthington hotel can accommodate groups up to 1,000 people making the hotel the ideal location for associations, conferences, banquets and weddings.Area attractions include the Ohio Expo Center & Ohio State Fairgrounds, MAPFRE Stadium, Nationwide Arena, Huntington Park, German Village, Columbus Zoo & Aquarium, COSI, the Brewery District and The Ohio State University. Nearby golf includes Muirfield Village Golf Club, home of the PGA Memorial Golf Tournament. Premiere shopping is minutes away including IKEA, Tanger Outlet Columbus, Polaris Fashion Place and Easton Town Center.The Crowne Plaza Columbus North-Worthington is close to world class medical centers including; St. Anns Hospital, OSU Wexner Medical Center, The James Cancer Center and Riverside Methodist Hospital. Christino's: Conveniently located adjacent to the hotel lobby, Christino's offers an exceptional menu in a convenient and comfortable setting. Grand Ballroom: The Grand Ballroom offers 7,500 sq/ft of event space. Perfect for meetings, weddings and social events. Buckeye Room: The Buckeye Room offers 2,000 sq/ft of meeting and event space. Pavilion: The Pavilion offers 4800 sq/ft of event space. Perfect for meetings, weddings and social events. Ballroom 1 & 2: Ballroom 1&2 offers 1250 sq/ft of event space. Perfect for meetings, weddings and social events. Ballroom 3 & 4: Ballroom 3&4 offers 2500 sq/ft of event space. Perfect for meetings, weddings and social events. Salon B & C or E & F: Salon B&C or E&F combinations offer 1150 sq/ft of event space. Perfect for meetings, weddings and social events. Cardinal Room: The Cardinal Room offers 675 sq/ft of event space. Perfect for meetings, weddings and social events. Salon B, C, E & F: Salon B, C, E & F (each) offer 575 sq/ft of event space. Perfect for meetings, weddings and social events. Salon A & D: Salon A & D each offer 552 sq/ft of event space. Perfect for meetings, weddings and social events. Salon 113: Salon 113 offers 480 sq/ft of event space. Perfect for meetings, weddings and social events. Executive Boardroom: The Executive Boardroom offers 480 sq/ft of event space. Perfect for meetings and social events. Capital Room: The Capital Room offers 360 sq/ft of event space. perfect for meetings and social events. Little Turtle Golf ClubThe Crowne Plaza Columbus North has a preferred relationship with a private club, Little Turtle Golf Club. The course is open for play Tuesday-Sunday and tee-times can be made by a front desk associate or our concierge attendant. Easton Towne CenterLocated in Columbus, Ohio, Easton Town Center is both a premiere and eclectic mix of nearly 200 shopping, dining and entertainment venues.